Spoilers ahead if you’re not caught up with Season 6 of Voltron. 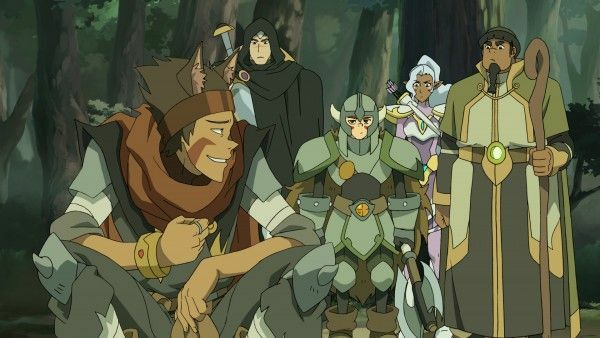 Hopefully you’ve had a chance to watch Season 6 of Netflix’s Voltron Legendary Defender in its entirety, because it might just be the best season yet. Not only does the seven-episode run advance the overall story beyond the conflict between the Paladins and Zarkon, it further develops characters on both an individual and relationship basis. Season 6 introduced new characters, mind-bending realities, alien worlds, all-new drama-infused conflicts, and all-out action. But there were also a lot of subtleties to the storytelling and production process that may have escaped even sharp-eyed viewers. And both the dedicated Voltron faithful and newcomers to the series alike might have some questions about just what they saw on screen this season. To that end, we bring you the second part of our chat with showrunners Joaquim Dos Santos and Lauren Montgomery; if you missed the first part or want a spoiler-free catch-up before Season 6, check it out here. (If you are caught up with Season 6 and want to share your thoughts, feel free to do so with our season review and finale explainer articles.) In this spoilery chat, we talked about freeing up the storytelling space and allowing for more artistic expression in this season, along with more specific plot points like the origin of Keith’s wolf, the newly introduced creatures, the Lotor arc (and whether or not his Sincline ship will be available in toy form; fingers crossed), the D&D-inspired episode, and Easter eggs. There’s a lot of good stuff here, so let’s get to it! Season 6 feels like the first season that really has room to breathe beyond the conflict with Zarkon. How much freedom did tying off that storyline grant you? 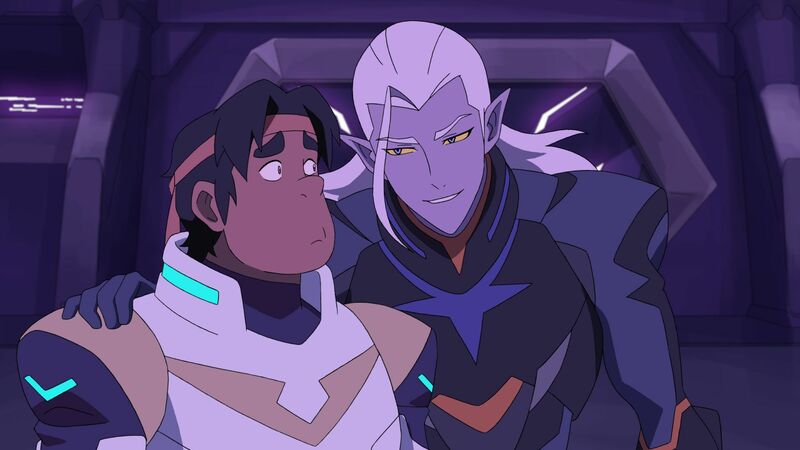 Joaquim Dos Santos: I think Lotor in general was sort of a breath of fresh air, just seeing that conflict through a very different lens. It wasn’t black-and-white like it was with the Paladins and Zarkon, there was a bit of gray area there. That alone as a storytelling element has just been a breath of fresh air and allowed us to stretch our legs a bit. Lauren Montgomery: Yeah, for sure, taking Zarkon out of the equation did actually free us up a little bit. Early on, we had these ideas of certain episodes we entered into the storyline but when we looked at it we found that, “Does this really fit if Zarkon is constantly pursuing them? Where are they finding the time to do this?” Having this nice moment where things have kind of settled down, they’re actually working towards peace now and they don’t have this person constantly pursuing them, it does allow for the team to kind of breathe a moment. We did take advantage of that and just have a little fun with the characters while we could, because nothing ever stays the same for long. We knew we were going to ramp things up again. Areas like the Quantum Abyss and episodes like “Monsters & Mana” really let the artists and writers let their talent shine. How gratifying was that for you and your team? Dos Santos: It’s incredibly gratifying. In particular, with the Quantum Abyss, we had been looking forward to, early on, telling some backstory for some of the characters. That was a story high point for us and we were really eagerly anticipating that. We had to kind of shift some things around due to scheduling, so when we finally got to the point, both from a visual perspective and a story perspective, I know the Quantum Abyss was kind of exciting for everybody, story and art. I think it’s a testament to the show itself. When you look at even the way the designers here just handle like what the representation of a planet is, it’s not always just a circle; we’re always trying to push things in a different direction. Montgomery: “Monsters & Mana” was just kind of a huge love letter to all of the video games, tabletop games, and just the fun elements that we love about that stuff. We pulled a ton of references, we sent it over to our designers, we let the designers kind of be influenced by that and have fun with it and come up with these crazy character designs for not only the alter egos of our Paladins but also populating that world. It was a ton of fun. Just seeing the designs come back from overseas and seeing what they’d come up with, it was just a breath of fresh air for everyone to be able to do something that was out of the norm for the series. It was invigorating. Dos Santos: We kept saying to each other during the edit of that episode in particular, “Let’s make this show! This show seems really fun, let’s keep making this show.” It was time for us to geek out and have fun with the stuff. Montgomery: The director Steve In Chang Ahn really went to the ends of the Earth to bring that episode home. Quick question: Do you have creature names for the space whales or the teleporting wolf? And was the wolf inspired at all by the weird Wolf Keith fan-fiction out there? Montgomery: It’s kind of that, more for Joaquim, that boy fantasy of like Snake-Eyes had a wolf.